Are you tired of your gizmos looking like the average geek’s gizmo? If you are, boy do I have a product for you. Now you can completely customize your mobile phones, iPods, PDAs, gaming devices and laptops with ease using vinyl skins from Cellfan. Cellfan offers the largest collection of branded vinyl skins for over 500 consumer electronics devices, which include mobile phones, iPods, PDAs, gaming devices and laptops. The skins are printed on 3M Scotchcal film. The skin is then coated with a glossy finish and custom cut to the fit the device. Plus they use a patented adhesive that sticks and re-sticks without leaving a residue on your gizmo when you take the vinyl skin off. 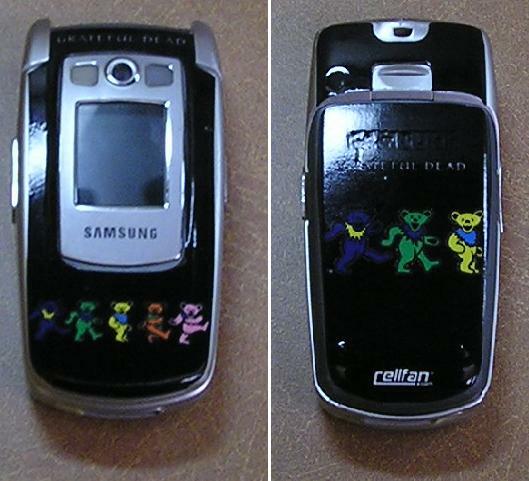 When Katie of Cellfan contacted me about a review, I requested a skin for my Samsung E715 mobile phone. Why my mobile phone and not my new laptop? Because my phone was looking bad, I’m afraid it had quit a few scratches from occasional drops. When I went to the Cellfan site to select my skin I was quit impressed with the selection to choose from. There were flags from all over the world, musical artist, models, sport team logos, college logos, military, comics, entertainment and art. I selected the Grateful Dead Dancing Bears skin, why because I’m a deadhead that happens to like gizmos. The vinyl skin arrived as promised in about a week in a FedEx cardboard envelope with a letter and a Cellfan press release, but with no instructions. Not that instructions were necessary – I’m a father with a young boy – I’ve put plenty of stickers on his toys, believe me! I peeled the vinyl skin from the backing, lined the edge as straight as possible and pressed the rest of the skin into place. Since the skins are vinyl, you can stretch it a little if needed, it was very easy. I smoothed a few small bubbles towards the edges so they could escape and it looked great. The whole process from opening the package to smoothing out the few bubbles probably took less than 3 minutes. I’m very happy with my mobile phone’s new look. Heck, I bet Jerry Garcia would like to give me a call from up above to tell me how crisp and clear the artwork looks from up there. But not only that, it really does hide all those nasty looking scratches that I’ve been living with for a couple of years. The bottom line is…Yes, I like this product – it was easy to apply and it looks great. I would say that if you are in the market to customize your gizmo then Cellfan is a must have accessory.